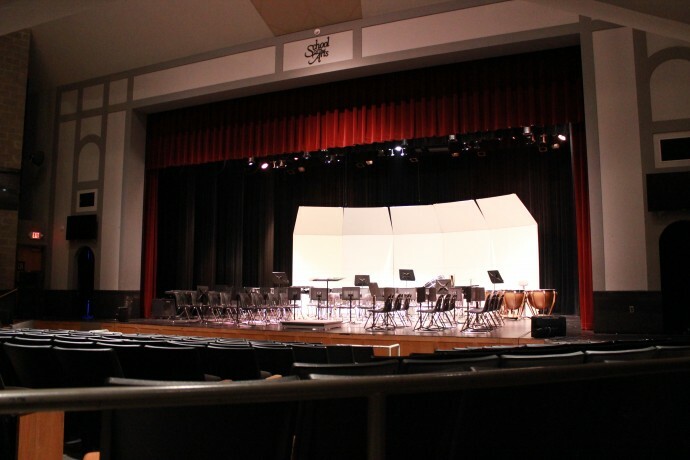 The Allen Main Stage Theatre at School of the Arts is a traditional proscenium arch-style theatre, ideal for large scale productions, music, and dance presentations. There is ample wing space to accommodate temporary set storage or quick costume changes. The theatre has a fly system, backstage crossover, orchestra pit, projection capabilities, as well as sound and lighting systems which may be accessed upon request. Dressing rooms are located below the stage and performer restrooms are within close proximity to the space. The Allen Main Stage is handicapped accessible and includes an Induction Loop hearing device system. Maximum seating capacity is 450. The Allen Main Stage includes a 200-seat balcony with elevator access; the first floor seats 250. Despite its size, the Allen Main Stage still maintains an intimate feel and the artists can easily engage the audience. Please Note: SOTA does charge a nominal technical fee for the Fringe performances we host. 450 seats arranged as Proscenium theatre with 250 seats downstairs and 200 upstairs. Areas and color washes; down light and side light; many possibilities. 24 channel digital board, 15 body mics, 4 hand mics, hanging mics and floor mics available; speakers throughout theatre. Two dressing rooms downstairs with ample space.